The annual Teaching and Learning Conference at Elon University is a free, regional event that brings together instructional designers, teachers, students, curriculum specialists and others interested in educational technology and pedagogical approaches from the research triangle in North Carolina. The 15th edition of this one-day conference took place on August 16th 2018. Moner explains how to set strong goals. My first session challenged participants to work on an innovative idea. 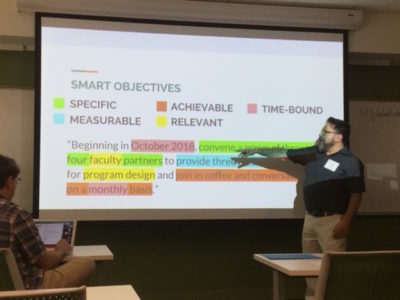 The ‘No-Limits’ Program Design and Innovation Workshop’ was delivered by William Moner and Phillip Motley, the Elon faculty members who initiated the Design Thinking Studio in Social Innovation. Participants worked through a series of individual and dyadic exercises to puzzle out the various aspects of their innovative project – a new course, a collaborative project, or an authentic assignment. Vaughn presented an alternative answer to why making matters as an educational practice: Makerspaces expose students to routine failure and a multitude of roadblocks – it’s exposure therapy to maladaptive perfectionism. Which problem does it solve to offer a space where learners can comfortably fail? According to Vaughn, students are failing to learn. Though they may excel academically, and get good grades, this happens solely by succeeding to navigate the educational system, and comes with a loss of intellectual curiosity and lifelong learning motivation. Learning involves struggle, success requires effort, and learning depends upon the ability and willingness to tackle complicated ideas and concepts. Vaughn sees three reasons that this type of intellectual resilience is not pertinent in today’s student generation. Standardized testing (learning is a destination rather than a process). As a result, students become apprehensive at trying something new, and avoid failure and confusion. Additionally, student populations present a growing percentage of depression and anxiety related disabilities. Makers mindsets – makers know what they know, and what they can learn. They understand that it takes time and effort to build something. They embrace failure. Makers don’t view a lack of success as a failure. “Just because you do not progress on something does not mean that you are not making progress”. 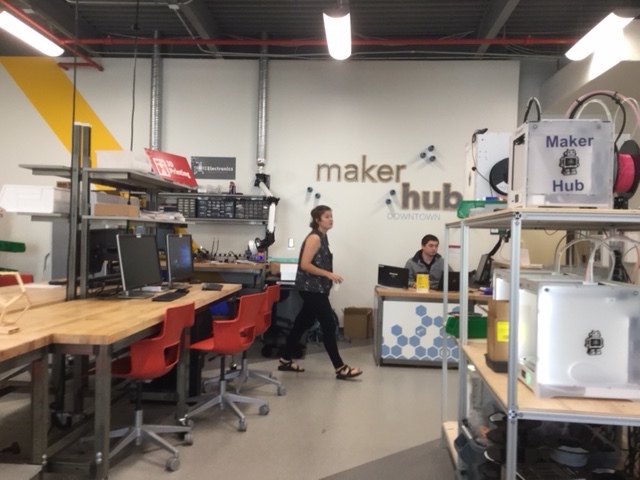 The Elon makerspace counted over 3,000 visits in the past academic year (2017-18), and is attracting a diverse population beyond STEM subjects. In addition, the makerspace team conducted activities such as the Marshmallow challenge and balloon powered vehicle building in 50 classes. As educational learning environments and their delivery methods become more diverse, it is critical for faculty and instructional designers to deliver content that is both culturally relevant and sensitive to the growing needs of diverse student populations. Chayla Haynes Davison is an Assistant Professor of Higher Education Administration in the Educational Administration and Human Resource Development Department at Texas A&M University. A critical pedagogue and scholar, her areas of expertise include racial consciousness in the classroom, critical race theory, critical race feminism, and intersectionality. She encouraged her audience to be mindful about the acceptable forms of oppression in the educational norms that imply a dominate and subordinate identity status. ‘Teachers and students together and simultaneously deal critically with reality and discover how to participate in the transformation of their world’. In her current research she analyzes demand documents (letters to institutions, newspaper clippings, social media hashtags such as #StudyingWhileBlack, #RhodesMustFall #Racismliveshere #whitecurriculum) at 75 institutions, cataloging examples of tokenism, invisibility, hypervisibility, white US centric curriculum, only-ness isolation, intersectional oppression, micro-invalidations and macro-aggressions. How can we facilitate co-constructed knowledge in web-based tools, within social media platforms, within learning management systems, within MOOCs? How can we design our courses, platforms, online environments so that they support learning by disrupting the codification of race and complicate gender, national origin, language, religion and geography?. 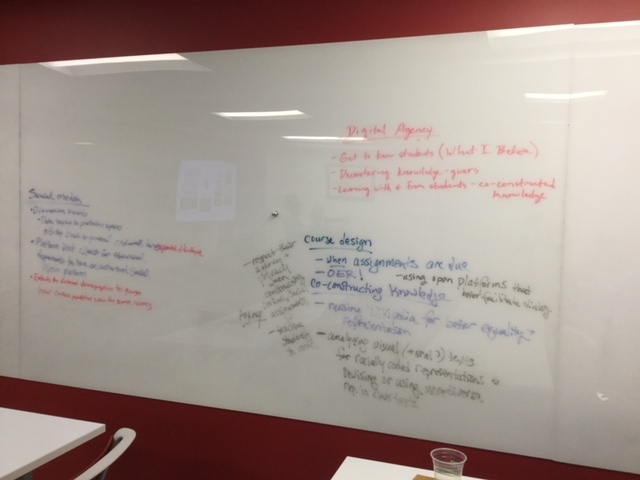 Participants shared their ideas on the whiteboard. Cheryl Ball presented selected concepts and lessons learned from the edited volume ‘Bad Ideas About Writing’ – a collection of state-of-the-art writing pedagogy material that debunks myths and all-time favorites such as the research paper or the five paragraph essay. The OER textbook was published in 2017, and has already been downloaded 18,000 times. 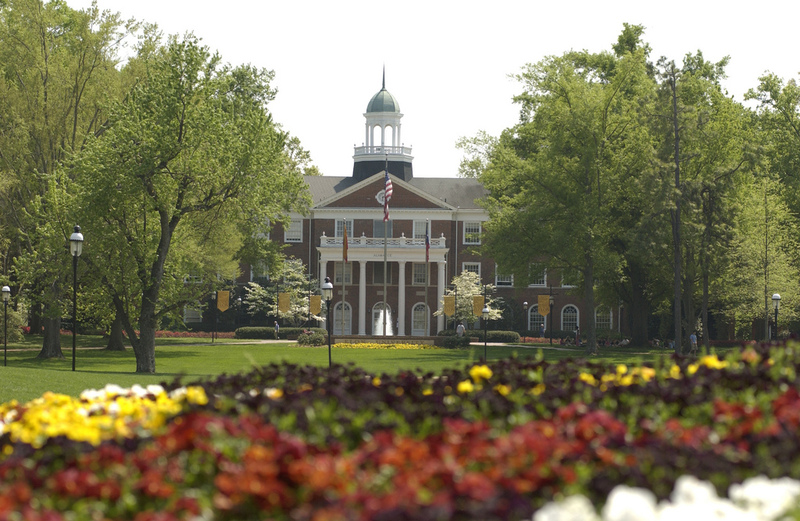 Interested in the topics discussed at Elon Teaching and Learning Conference? The following blog posts offer further reading, interviews and project reports.